Position: How Tos - Partition Management - How to format EXT4/3/2 in Windows 10/8/7/XP? This post talks about methods to format EXT4/3/2 in Windows, read data in EXT4 partition and create EXT4 partition under Windows. If your computer is dual booting Windows and Linux, you may need to access data on Linux system from Windows. This guide is focused on methods to deal with operations about EXT4/3/2 file system in Windows 10/8/7/XP. 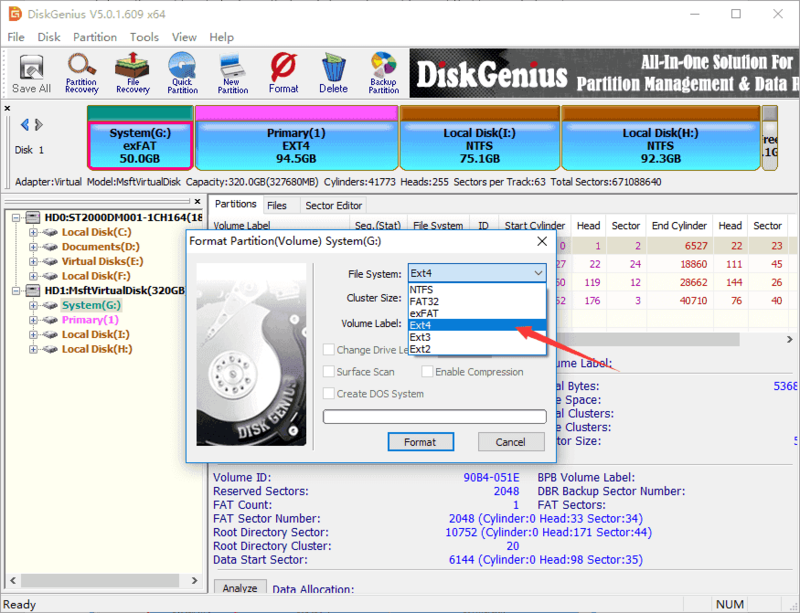 DiskGenius - Efficient partition manager to format, create, read & write EXT4 Linux partition in Windows. File system is the method by which files are named and placed logically to store, retrieve and update data and also used to manage space on available storage devices. Without file system, files stored on a device would be one large body of data, as data does not know where to stop or when to begin. Information stored on device media is split into two pieces, which are usually called metadata and user data. The structure and logic rule used by system to manage data is called a file system. There are many different types of files system, and each has its own structure and logic rules, speed, size, etc. File system is widely used on various storages devices such as hard drive, flash memory, virtual disk, etc. As a Windows user, you must be family with FAT32, exFAT and NTFS. In this section, we'll talk about file systems Ext2, Ext3 and Ext4, which belong to Linux operating system. It is easy to format a partition to ext4, ext3 or ext2 with the help of DiskGenius Free, and the formatting speed is fast. Please note formatting wipes all data from the volume, and you should make sure important files have been backed up. Let's see have a look at the formatting steps. Step 1 Install and launch DiskGenius from computer and you can see all partitions on the disk. Step 3 Choose file system type you need from the Format Partition window and click Format button. To format ext4, you should choose Ext4 from the drop-down list. Step 4 Click Yes to continue. Wait for several seconds and the formatting will complete. Note: Since V4.9.5.508 PartitionGuru changed name to DiskGenius. Windows uses NTFS, FAT32 or exFAT file system and Linux uses extended file system like ext3, ext4. Windows does not support to read, write or access Linux file system without the help of third-party partition tools. As we all known, Windows users cannot create partitions with these file systems easily in Disk Management. How to create an Ext4/3/2 Linux partition under Windows? 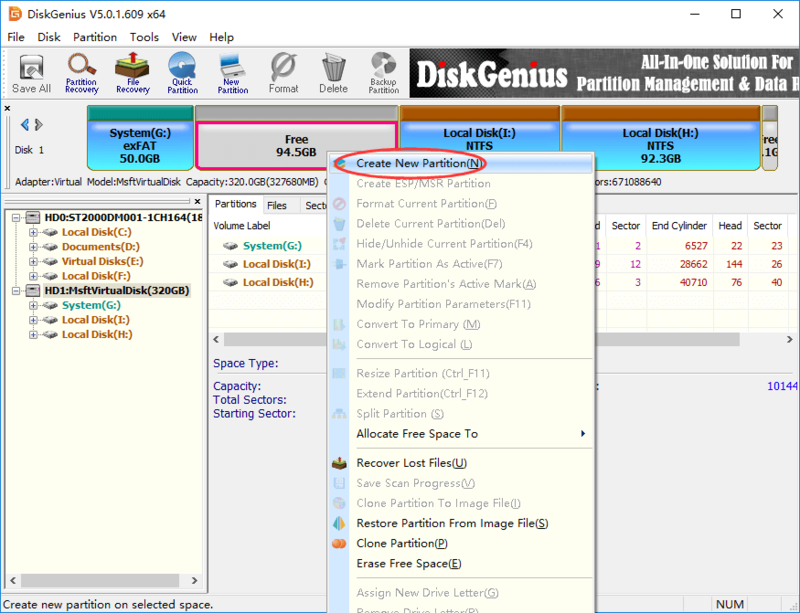 Here, we recommend a free partition tool – DiskGenius Free to fulfill the task. 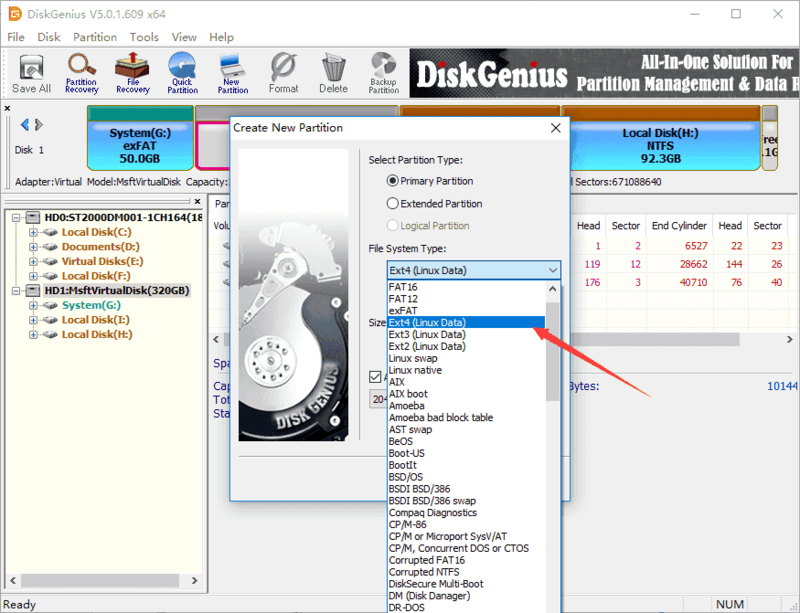 DiskGenius can be used under any Windows platform, and it provides a bunch of useful features like data recovery, disk & partition management, data backup, repair bad sectors, edit hex data, etc. The recently released version adds support to create, format, read or access ext4 / ext3/ ext2. So, we can use this partition tool to create an ext4 /3/2 partition in Windows. Step 1 Right-click on free / unallocated disk space and select Create New Partition from context menu, as follows. Alternatively, you can select free disk space and click New Partition button. Note: If there is not free disk space on your drive, you can use DiskGenius shrink one partition to free some disk space. Also, you can just delete a partition whose files have all been backed up. Step 2 The "Create New Partition" box comes up, and you can select file system type now. To create ext4 partition, you should select Ext4 (Linux Data). Then click OK button. Step 3 Click Save All button on the upper-left panel to save the new partition to partition table. 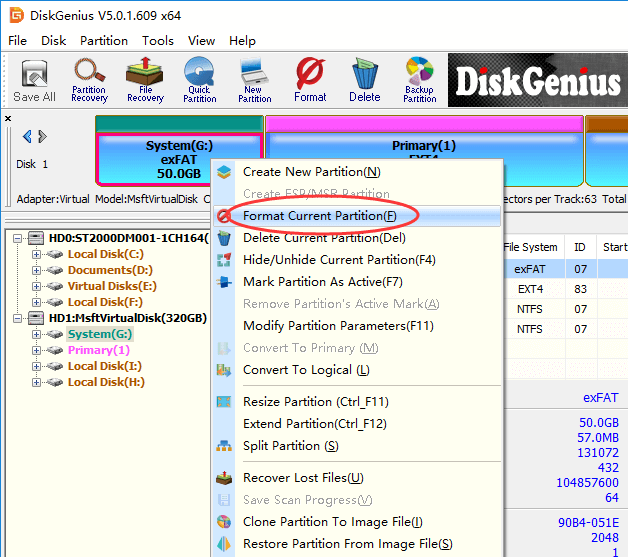 Step 4 DiskGenius asks whether to format the partition after it is saved to partition table. Click Yes and the partition will be formatted quickly. 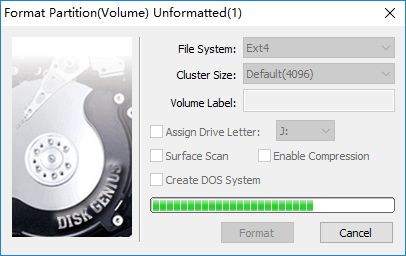 DiskGenius makes it very easy to format partition to EXT4, EXT3 or EXT2 file system in Windows. Besides, it provides many other functions to help you manage and access EXT4 Linux partition effectively. For instance, save data to ext4 partition, delete data from Linux partition, clone EXT4 partition to image, resize Linux partition without losing data, etc. 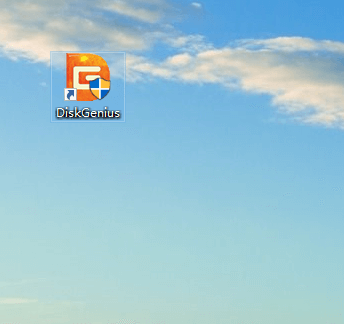 If you need to format EXT4 in Windows, free download DiskGenius and try it now. DiskGenius - Makes it easy to access EXT$, EXT3 and EXT2 Linux partition under Windows.